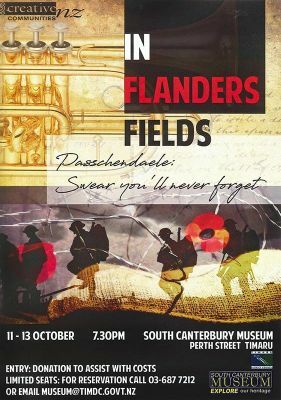 In Flanders Fields is a short play with music that will be performed at the South Canterbury Museum in the evenings on 11-13 October, to commemorate the centenary of the battles at Passchendaele, where so many New Zealanders lost their lives. The event will consist of readings, songs and musical performances drawn from the period and its aftermath. Admission is by donation, and booking is required due to limited seating.